The relationship between a patient and clinician is an essential part of treatment and one we are committed to ensuring will be strengthened by new high-tech tools and technologies under development. These will provide more effective care in the clinic, which can be extended seamlessly into patients’ daily lives through digital supports. Within CAMH’s Campbell Institute, brain science is translating into new and innovative clinical therapeutics. This past year, a nutritional supplement kit, taken by women days after giving birth, reduced the “baby blues,” a precursor to clinical post-partum depression. Unlike most current therapeutics or medications discovered by chance, the kit was purposefully developed by Dr. Jeffrey Meyer, the Canada Research Chair in the Neurochemistry of Major Depression and a CAMH Senior Scientist, based on past research on brain chemistry. It shows a direct line from brain discovery to clinical impact. At the Temerty Centre for Therapeutic Brain Intervention, novel brain stimulation treatments based on brain physiology and neuroplasticity (the brain’s ability to adapt to changing circumstances) are making a difference for those who have not responded to other treatments. Studies in repetitive transcranial magnetic stimulation (rTMS) have demonstrated improved depression symptoms for patients. Different types of brain stimulation are now being investigated in large multi-site studies on obsessive compulsive disorder and dementia prevention, as well as in innovative pilot studies for autism and youth with depression. 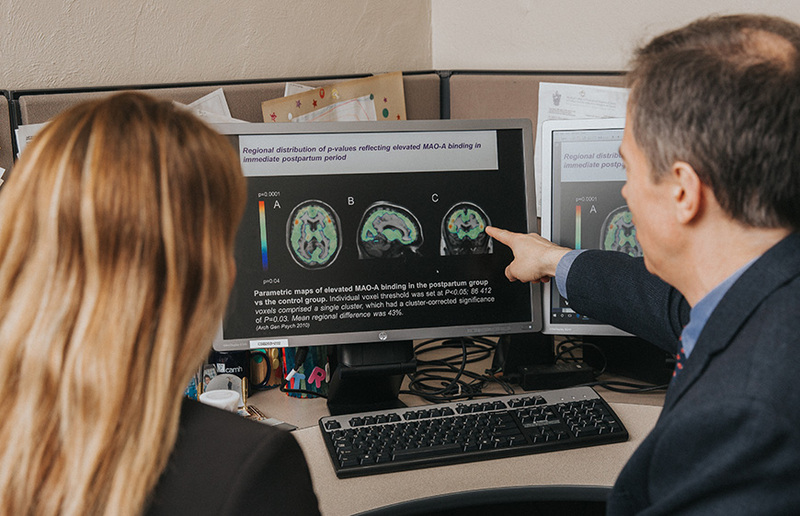 Dr. Yekta Dowlati and Dr. Jeffrey Meyer view brain scans generated by positron emission tomography (PET). The smartphone revolution has led to opportunities for empowering and engaging patients in their recovery. At CAMH, app development takes an evidence-based approach, which is essential to show if an app is actually effective. A4i, one of several apps under study at CAMH, was designed to help people with schizophrenia manage their care. “A4i takes an individualized approach that addresses social isolation, engagement in both psychosocial and medical treatments, and fosters psychological resilience,” says Clinician Scientist Dr. Sean Kidd. “We hope this leads to improved outcomes for patients.” Other apps under study include a cognitive-behaviour app for youth, the Thought Spot app for locating mental health resources for students, and an app designed to boost motivation in people with schizophrenia. Data science — the collection, curation, retrieval and analysis of scientific data — is another priority at CAMH. In the summer of 2017, a new database platform will be available to CAMH scientists that will integrate terabytes of data generated through brain imaging, genetics and clinical research to advance discoveries in mental health. This new neuroinformatics platform uses the Brain-CODE platform developed through a partnership with the Ontario Brain Institute. With CAMH’s large and diverse patient population, the platform will be a rich source of data, which can be quickly mined to answer questions that might otherwise take years through conventional studies. “This could be a unique and powerful resource for Ontario, Canada and internationally,” says David Rotenberg, Manager of Scientific Computing. CAMH experts are taking a leadership role in adopting as well as training others in novel tools and technologies that support patient care. 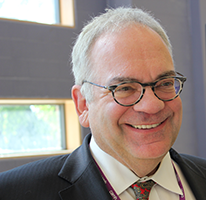 CAMH’s Simulation Centre, funded by an anonymous donation to the Medical Psychiatry Alliance, collaborated with Maudsley Simulation from London, U.K., to offer two simulation-focused training courses at CAMH on the intersection of mental and physical health. These will be adapted and offered by CAMH in the coming year. In another example, Temerty Centre scientists routinely offer a course to train other physicians in rTMS. “There’s growing interest in patients and providers regarding rTMS, as it offers a new therapeutic option for patients who have not responded to other depression treatments,” says Dr. Daniel Blumberger, Co-Director of the Temerty Centre.